Approximately 1,500 students and teachers at Berkeley High School in northern California staged a walk-out Wednesday morning in protest of Republican Donald Trump’s victory in the presidential election Tuesday. According to NBC News, students at the school walked out en masse Wednesday morning, with some holding Mexican flags and signs reading “F*ck Trump,” and “Not our president.” The students reportedly marched to the campus of the nearby University of California Berkeley, where they were joined by students from other nearby schools and by some teachers. 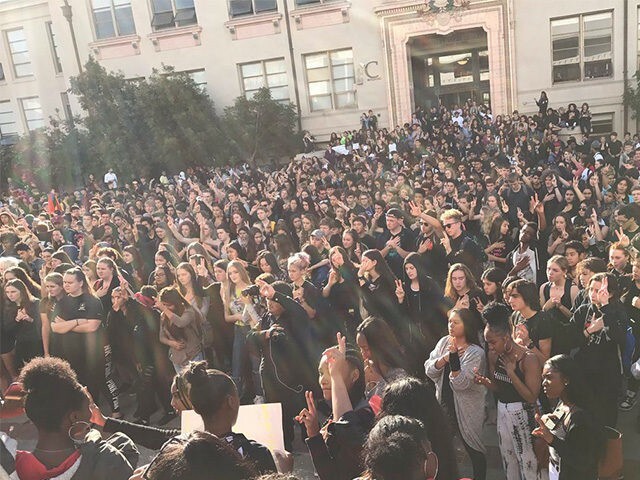 Students at Oakland Technical High School, the Bishop O’Dowd school and Lincoln High School in San Jose also reportedly staged walk-outs on Wednesday. The protests in the Bay Area Wednesday morning echoed numerous similar events across the country after Trump defeated Democratic candidate Hillary Clinton in a highly contentious presidential election. Trump’s win came as a surprise to million across the country as Clinton was heavily favored by most polling ahead of Election Day. Thousands of New Yorkers took to the streets of Sixth Avenue in Manhattan Wednesday evening in protest, many of them chanting, “He is not our president” and other similar slogans. Similar demonstrations occurred in Boston, Los Angeles, Washington D.C. and San Francisco Wednesday. The progressive organization MoveOn had organized hundreds of anti-Trump protests across the country in the hours after Tuesday’s historic vote. Schools in Los Angeles are taking additional steps to help those disappointed by the election outcome. The Los Angeles Unified School District, in which 74 percent of students are Latino, announced Wednesday that counseling would be available for students upset by Trump’s victory.